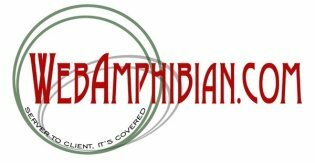 This WebAmphibian.Com web application is designed to make creating print and interactive on-line tests easy. Using virtually any Microsoft Windows computer, instructors can create multiple-choice, true/false, and select question tests that are dynamically changed each time they are utilized. The ability to bundle tests for distribution to others with testOmatic for their use. Using testOmatic is as easy as filling out a web form. The instructor is presented with a number of screens, each for defining one aspect of a given test at a time. Test - Consists of a title, a sub-title, and a description. Section - Consists of a header and a description. Questions - Consists of a question, a question type, and optionally an image to display as part of the question. Answers - Consists of an answer (one of possibly many) and optionally an image to display as part of the answer set. Utilizing the compiled HTML Help file system in much the same way as our KidDrills product, testOmatic creates four different versions of any one test (outlined below). No two tests are guarenteed to have any series of questions in the same order. Further, the same question on two different tests are not guarenteed to have answers in the same order. This property of testOmatic makes it very difficult for "answer stealing" or "cheating" to be beneficial to students. Also of note, as testOmatic generates all four of these test types using the same entered test data, all tests have the exact same wording, for any one test, section, question or answer, everytime. No longer does an instructor have to "proof read" each test. testOmatic does the work automatically! Below you will find examples of each of the four test types testOmatic generates. To view each of these, right click on the title, and save it to your desktop. You will need Microsoft Internet Explorer 4.01 (or better) installed to view these samples. The interactive test will allow the student to take the test on the computer and have it graded automatically. A grade sheet is generated at the end of the test, giving the student their score and telling both the instructor and the student exactly which questions were missed. The student need only print this grade sheet at the conclusion of the test to turn in a permanent record. The grade sheet also shows the instructor the exact questions that were missed by using a code that corresponds to the exam review (described below). The practice test is intended to be taken on the computer and gives the student immediate feedback on whether they answered the question correctly or incorrectly and keeps a running tally of total number of correct and incorrect responses. The same grade sheet is produced at the end of the practice test as is done for the interactive test. The print test option simply allows the instructor to print out a hard copy of the test for the students to take the test on paper rather than on the computer. To make grading a snap, the answer key to any given print test is output on a separate page in the same print job. The exam review serves a two-fold purpose. One is to verify that the questions and answers have been entered correctly by the test generator. The second purpose is for the instructor to be able to cross-reference the code on the exam grade sheet and see exactly which questions the student missed. WebAmphibian.Com was approached by Multistate Academic and Vocational Curriculum Consortium to create a tool for generating KidDrill-like files based on specific curriculum that they already had in-house. After about a year of cooperative work with MAVCC, testOmatic was created. This web application allowed for instruction development specilists within the MAVCC organization to collectively convert their paper curriculums into electronic representaions, using the Compiled HTML Help facility from Microsoft. 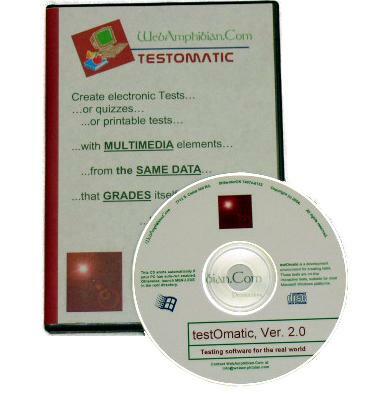 The product that MAVCC sells, "The Test Generator", is a direct predecessor of WebAmphibian.Com's testOmatic.